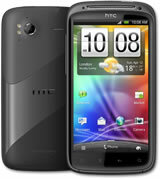 The HTC sensation offers the stunning qHD display along with Hi-Fi audio technology. Running on the Android OS, this phone offers a number of video watching options. HTC Sensation delights us with solid design, good camera and a quality audio output. Right from its launching, HTC Sensation�s slick screen, slightly indented into the case, made an impression. The Taiwanese manufacturer intends to compete against Samsung Galaxy and iPhones with this terminal, so you know you�re in for a surprise when we go more into detailing HTC Sensation�s features. The back cover of the HTC Sensation covers the top of the phone which makes it slick but also a bit difficult to open without switching it off at least by accident. Nevertheless, the cover is well designed, and it is made of aluminum which adds to the phone�s durability. The manufacturer decided to include the radio antennas in this aluminum casing. You have to love the way HTC�s full touchscreen display looks and feels. HTC Sensation comes with Gorilla Glass for durability and protection from scratches. Having a 4.3" diagonal, HTC Sensation screen is one of the larger terminals on the market. Even better, the resolution is similar to iPhone 4's Retina Display, a thing made possible by Samsung and Sony joining forces to create the S-LCD. The display enables HTC sensation to render quality images visible under most lighting conditions. Still, HTC disappoints a bit when it comes to the quality of the images, or at least disappoints those with an eye for minor imperfections because for the rest of us, the viewing angles and the quality of the image are just fine. The moment camera is turned on you can make a clear picture in only 2.2s, and this makes the HTC model a true Sensation. You could say that the picture is taken instantly with pressing the virtual button; the focusing is fast and the general quality of the photo is largely dependent on lighting conditions. As more and more Internet content is delivered using Flash applications, and most smartphones have a hard time rendering web pages with ease, HTC amazes with its high speed and generally with a very pleasant web browsing experience. It is safe to say that HTC Sensation is one of the few smartphones to offer such a complete web experience. HTC is also proficient with filming as the autofocus works well and the image is sharp. HTC Sensation delights us with solid design, good camera and a quality audio output. HTC Sensation is a powerful smartphone with a good looking and speedy interface powered by a dual core processor and running the Android 2.3 OS. Even though the smartphone arena is always welcoming new players that tend to surprise, HTC Sensation sure is one fantastic terminal most people don't need upgrading yet. Microsoft Prepare ‘Touchable 3D’ Technology?